Vito Olszewski, head chef and owner of Vito’s Ristorante, in Roscoe, Ill., works alongside his son, Adam, and several other family members. 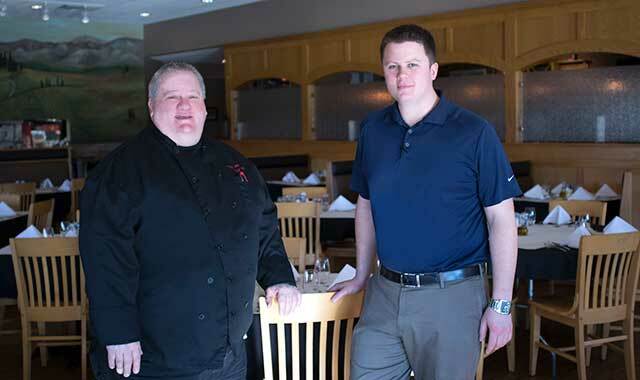 Vito’s Ristorante just celebrated its one-year anniversary in its new home at 4866 Bluestem Road, in Roscoe, Ill., capping off a year of big change in the life of a family that’s been in the restaurant business for generations. Earlier this month, the family matriarch, Frances D’Agostin, celebrated her 100th birthday at the restaurant. She and her husband, Ferdinand, opened the Auto Inn in downtown Rockford and also owned D’Agostino’s, The Stadium and The Grotto. D’Agostin’s grandson, Vito Olszewski, together with his wife, Marie, are following handsomely in the family’s tradition. Marie says her husband not only has a talent for cooking and running a business, but he truly cares about his customers – and they know it. “He’ll go around to the different tables and talk to customers to make sure they are having a good dining experience – and he’s genuine about it,” she says. The couple’s son, Adam, is the manager; their daughter, Rachael, has helped out at times; Vito’s mom, Barbara, uses her mother’s familiar recipes to make meatballs, sugo, alfredo sauce and homemade soups. Olszewski’s signature dish is among the most popular selections on the menu. Conchiglie alla Sarda is made with shell pasta, ground sausage, and peas mixed with a tomato cream sauce. Other menu items include Salsiccia con Pepperoni, made with grilled sausage, quartered potatoes, sauteed onions and bell pepper; Vegetable Pasta; Salmon with seashell pasta; Lobster Ravioli; and other Italian fare. From the grill, there’s Chicken Marsala, Red Snapper, Salmon, an 8-ounce Filet Mignon, and a 20-ounce bone-in Cowboy Rib Eye. Desserts feature Adam’s signature Creme Brule and Tiramisu, in addition to Cannoli Cake, Carrot Cake and Cannolis. Rockford diners may recognize Olszewski for his former storefront on Rockford’s Bell School Road, which was open for about five years. In 2016, Vito moved into the former Digiovanni’s Ristorante, a space about three times bigger. The new dining room seats about 130 people, while an outdoor patio, which opens this spring, seats about 60. Before moving in, Olszewski updated and renovated both the kitchen and the banquet room, which has all-new flooring, a bar and a dance floor. The large room seats up to 200 people but can be partitioned off for smaller crowds. “We want to get people into our restaurant for dinner, but we also want to celebrate with them all the special moments of their lives,” Olszewski says. Olszewski thought his life in the restaurant business had come to an end when Auto Inn closed in 2001. He felt “burned out,” having worked many years and long hours, going through the same routines. But then he moved to Chicago and got a degree in Culinary Arts from LeCordon Bleu Cooking & Hospitality Institute of Chicago. He returned to Rockford with new skills, a new attitude and a new direction. In Chicago, Olszewski was introduced to the particulars of fine dining and international cuisine. He worked at the Signature Room in the John Hancock building, and in 2003, he earned the James Beard Foundation Award. Olszewski credits his experiences and the chefs he worked with in Chicago, especially Chef Tim Bucci, for paving the way to his success. Vito’s Ristorante is open Monday through Saturday starting at 4 p.m. Reserve a table online by going to opentable.com or vitosristorante.net. This entry was posted on Thursday, March 30th, 2017 at 12:00 pm	and is filed under Dining Guide, Top Posts. You can follow any responses to this entry through the RSS 2.0 feed. Both comments and pings are currently closed.